I know I’m a little late, but won’t you follow me on Twitter? Two years! Are you serious? I missed it again, March 13th was my two year blog anniversary. I know I wasn’t as “active” this year. Too much to do. I sewed a ton, but didn’t feel like writing about it. It takes me forever to write a post. How do people do it every single day? Take pictures, edit, write, edit more and publish. It takes me hours- seriously. Little girl moves into big bed. If I’m really excited about something, I’ll write about it. If not, it just slips on by without much attention. Maybe I shouldn’t stress about it. I love to blog. I love to re-read all the posts over the years and see how much things have changed or stayed the same. I love my journal ’cause really that’s what this blog is for me. First tooth to be lost. I should do a give-away or something, huh? Hmmm… what should I sew? Eddie's treasure found while mushrooming. Okay, I got it. I’ll whip them up in the next couple days and will do a give-away post soon. Thanks for sticking around guys! Family photo taken February in Culver. I said that I would give this pattern another try. I did things a little differently this time, – chain piecing the layers, making both tiers at the same time and using the serger for most of the sewing. 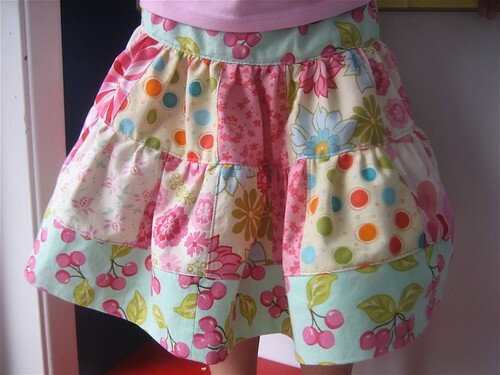 I also made two skirts at the same time. (It’s SO much more efficient!) One for a cousin’s birthday and one for my little pink lover. Ms O was a little confused because these fabrics are the same ones I used for her quilt, but she soon got over it and was twirling with happiness this morning. 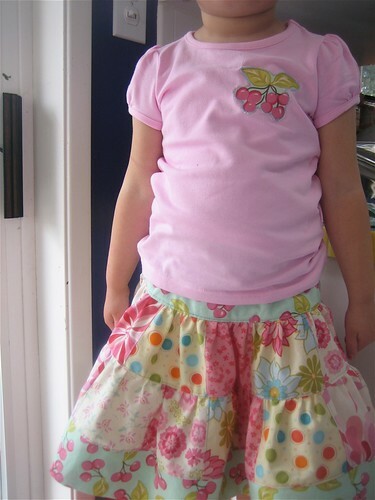 Things I love about this pattern- Pink Fig’s Patchwork Skirt. – I love all the top-stitching. I always think it’ll be a pain, but really it goes fast and the result is so cool. 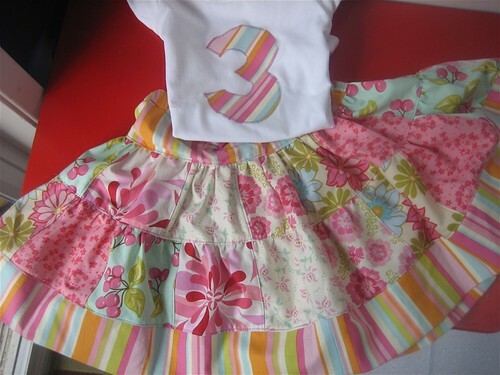 – I love that you can use as many fabrics as you want and you could easily use scraps. Did I? Heck no, that would mean having to sort and I can’t possibly do that. – I love the fit. It hangs just right. So cute. – I love the accurate measurements. Things fit nicely together! I’m always worried when I see an exact band measurement, like for this skirt the band at the bottom hem. I don’t know how accurate I truly was sewing all those little squares together and gathering, etc. For this skirt, I’ve made it three times now and each time the band fit perfectly in place with no stretching or bunching in order to get it to fit. Love that! This pattern goes up to size 7 so for $11 this pattern is a great deal. I know I will be making many more in the years to come although hopefully with not so much pink!